It's another season once again from Kodoku no Gurume (Fall 2015, TV Tokyo) now on its 5th run. It stars Matsushige Yutaka as Inogashira Goro, the lone foodie and teetotaler who loves eating and discovering good food and new eateries during his business travels in and around Tokyo. Manga creator, Qusumi Masayuki is also back with his end segment, "Furatto Qusumi", visiting the featured eateries and interviewing their shop owners. For the first time in the show, Goro will finally be visiting a shop overseas! New Year SP: Midwinter Hokkaido Asahikawa Business Trip Edition. "Shinkoyaki and Crab Crea~m Croquettes of Asahikawa, Hokkaido"
Episode Synopsis. It is early in the new year, and Inogashira Goro (Matsushige Yutaka) arrives in snowy Asahikawa, Hokkaido for business. It seems he is having a busy start of the year, and he strives to finish his work on time. As a result, he feels jumpy every time his phone rings and could not relax. So he goes out of his hotel room for a little walk on a snowy day around the town, leaving his phone behind. He eventually feels hungry, but before he could attend to his stomach, he buys some boots to use in order not to slip on the icy sidewalks. After looking around for an eatery that gives a sense of "the Hokkaido feeling", he settles on a tasteful izakaya with on old-fashioned and quiet feel, "Lone Drinking, Sanshiro". He is welcomed in by the proprietress (Tokoshima Yoshiko). Goro then has a scrumptious and comforting meal consisting of shinkoyaki, omelet, mushroom soup and corn tea. Ep. 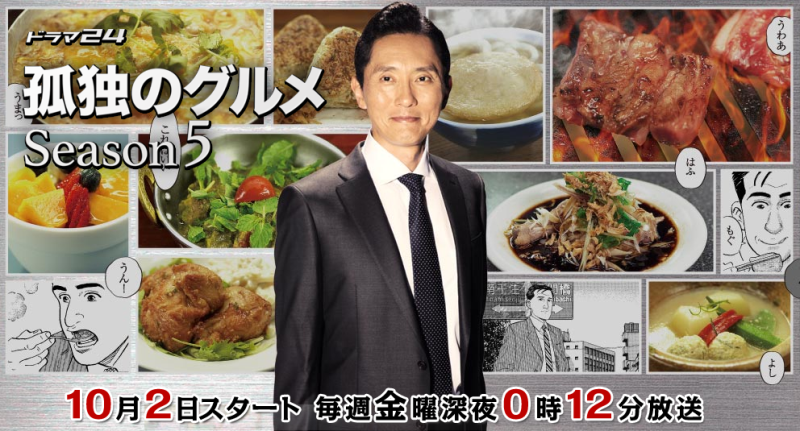 12 Finale: "One-Person Sukiyaki of Nishi-Sugamo, Toshima Ward, Tokyo"
Episode Synopsis. Inogashira Goro (Matsushige Yutaka) arrives at real estate company in Nishi-Sugamo in Toshima Ward. At the request of his client Morita (Keiichi Noda), he has come to preview a shop his client is eyeing to rent. While he is filling in an entry form, the company president (Tsuchiya Nobuyuki) and employees (Hanawa Nobuyuki, Hosono Kyoko) are all trying to read his last name, and somehow pronouncing it wrong. Goro is bewildered since he assumes his last name is pretty easy to read... Then, later on, after previewing the shop, Goro feels hungry. He hurries and finds a shabu-shabu and sukiyaki shop called "Shabu Tatsu" along an old-fashioned, quaint shopping street. Inside, there is a rarely seen U-shaped counter. Goro finds the set meals quite tempting. When asked by the proprietress (Yasuko Tomita) what his order is, Goro chooses a luxurious solo order of sukiyaki set meal with prime beef cuts. What a fitting choice for an advanced year-end banquet! Ep. 11: "Omurice with American Sauce and Oysters Meuniere of Sengendai, Koshigaya, Saitama Prefecture"
Ep. 10: "Jun (Chicken) Liver Bowl of Kameido, Koto Ward, Tokyo"